1. Follow me, the host! Next week, I'll try to pick a new blog from this week to feature. Have fun, and I look forward to getting to know so many of you! Linking up to your hop now! Happy to be linking up for your first week! 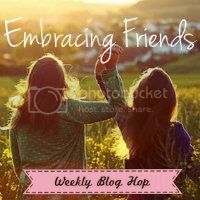 As it turns out, I too am starting a link-up this week. It is a photo show and tell where we can come together and share the images and stories from our lives. I'd love it if you'd consider linking up some of the amazing pictures I often see on your blog.